A group of British soldiers, led by inept Commander Goodbody (Michael Crawford), is assigned the task of clearing a mine-ridden cricket field in North Africa. 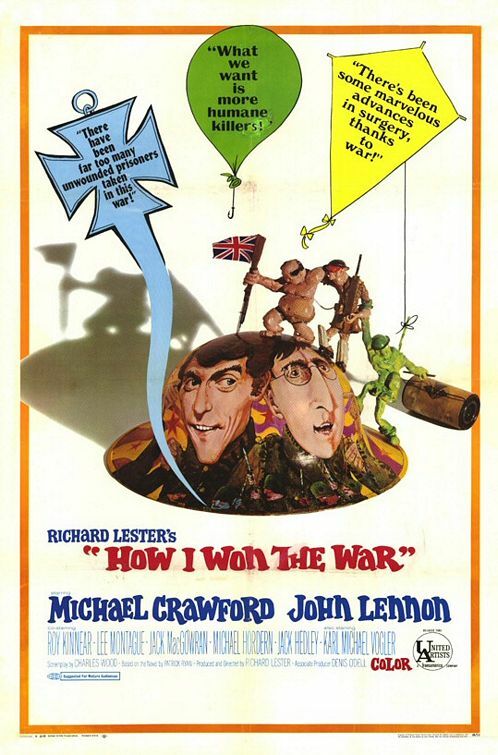 Peary describes this Richard Lester anti-war spoof as “shaky but funny and fanciful” — all true, though the “absurdity of war” trope has been played out to stronger effect numerous times since this film’s release, i.e. in Three Kings (1999). In addition, as Roger Ebert points out, it’s difficult for American audiences to understand what the British actors are saying much of the time. Meanwhile, John Lennon — the major attraction for many would-be viewers, especially given that his face envelops the video/DVD cover — plays such a minor role it’s tempting to sue for false advertising; it is actually spindly-legged Michael Crawford (of Phantom of the Opera fame) who is the primary protagonist and narrator of the movie, and he carries the role well. The film’s best moments occur when Crawford is befriending the German commander in his POW camp — an “absurd” situation with the potential for genuinely radical consequences, yet one which is sadly underdeveloped. A Richard Lester movie is one in love with itself. Not that there are exceptions. But his more successful films (i.e., ‘A Hard Day’s Night’, ‘A Funny Thing Happened On The Way To The Forum’) contain elements that supersede his importance. Here, Lester has a top-notch cast; however, they’re simply subservient to his ‘vision’ – which includes a superficial recognition of the horrors of war. It’s true that much of the film seems mumbled by the cast. It’s true that much of Lennon’s ‘performance’ seems spliced-in. It’s also true that the best part of the screenplay is the under-developed relationship between Crawford’s character and the German commander. Quite apparent is that the film’s chief asset is DP David Watkin (‘Mademoiselle’, ‘Catch-22’, ‘The Devils’, ‘The Boy Friend’, ‘Out of Africa’, etc.). The look of the thing is often breathtaking. If only a real film went with the expert visuals. All too soon, this becomes one-note and tiresome.